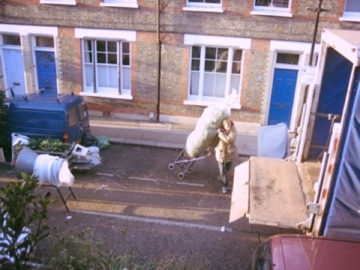 The evocative smell of pine needles in the build up to Christmas always takes me to Columbia Road Flower Market. It’s well worth a trip there at any time of the year but I particularly love it in December. At 4am the market gets unpacked onto the street with the sound of each lorries beeping reversing. Followed by the clatter of plant trollies rolling off the back. By a normal waking hour, ‘25 any size’ rings out across the street, by lunchtime pine needles have formed a thick heady smelling carpet across the battered tarmac. The soft pine forest floors, that absorb the sound of your footsteps are transported to the city streets. It is magical. According to these wise market men, to keep your christmas tree looking it’s best, cut an inch off the trunk when you get it home and put it straight into water - alright darlin?